Andalucía is a region of contrasts. Magnificent cities, historic monuments, skiing, countryside and the famous Costa del Sol. It´s all there and usually not more than a couple of hours away from wherever you are. At the weekend we drove slightly north from where we live, over the border from Malaga province into Granada province, Big Man´s heartland and into some wild and rugged scenery. Near his home town of Ventas de Zafarraya is an area of fertile plains. A huge amount of vegetables are cultivated and grown there and this provides much needed employment for many people. Moving north again you come to the beautiful town of Alhama de Granada and between these two towns are a series of lush green plains divided by area of rough, rocky, almost lunar landscapes. Water comes up through the rocks and provides irrigation and drinking water for plants, animals and Cortijo dwellers. Some Cortijos sadly remain abandoned, mainly due to the inheritance laws here in Spain which pretty much oblige you to leave your property to your offspring. When families have 10 or more children, it´s understandable that families were often unable to come to an agreement regarding whether to sell, divide or buy each other out. After a magnificent lunch of goat cooked over an open fire we set off to walk to a local goat farm and buy cheese. ….and it was milking time. Some of the group also bought milk, luckily I had been given some that morning by one of our local goatherds. There were one and two week old kids….adorable! A family of strange looking turkeys were keeping everyone in line out in the yard. Our walk took us past a tree which the locals called a Millennium tree, because of its supposed age. It took five women to get their arms around it….and sometimes it´s good to hug a tree! And finally a walk back to the Cortijo for coffee and cake. Sometimes the simple things in life are just what you need. Making yogurt at home is very simple. No need for yogurt makers, thermometers or complicated equipment. I don´t claim that this yogurt is Greek, as the milk I´m using is from Spanish cows (hopefully!) but the taste is the same creamy taste and texture is thick and gorgeous. Are you ready? Ok, then this is what you´ll need. Fresh Milk – I used two litres, but you can make any quantity you like. I also used semi skimmed, but you can use whole or skimmed if you prefer. 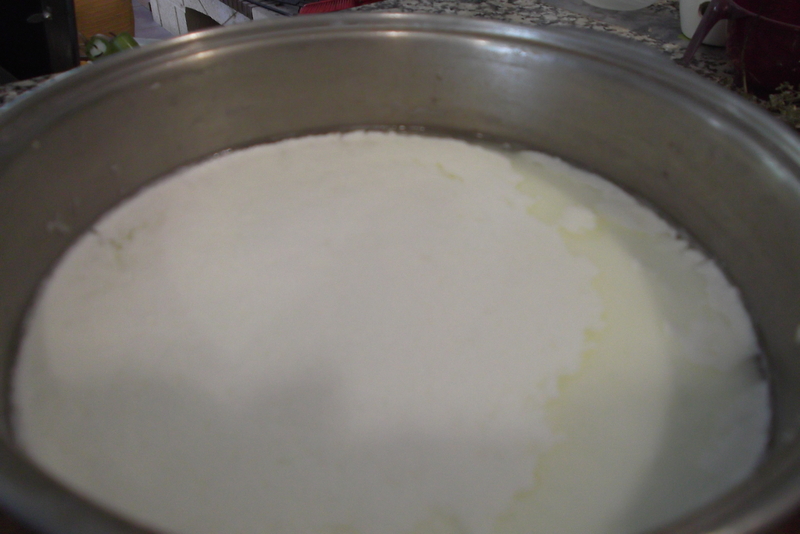 Start by heating your milk until small bubbles start to form around the edges of the pan. Turn off the heat and whisk in your carton of yogurt. That´s it for now! You have several options at your fingertips to get this milk to do its magic and turn into yogurt. As it´s hot here at the moment, I put a lid on my pot and sit it in the sun for about five hours. You can put a lid on the pot and leave it in a very, very low oven for up to 12 hours – check on it after about 5 hours to see how it´s doing. You can even leave it overnight. Put it into a warmed thermos flask and leave overnight. 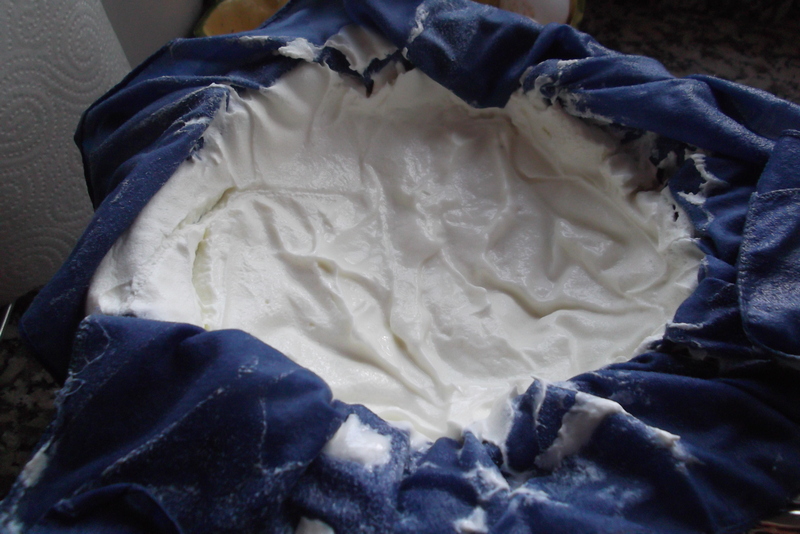 When you´ve done this and waited patiently, your yogurt will have formed and will look like this. Yogurt with some watery liquid surrounding it. You could just whisk it all together and eat it as it is, it´s pretty delicious already. 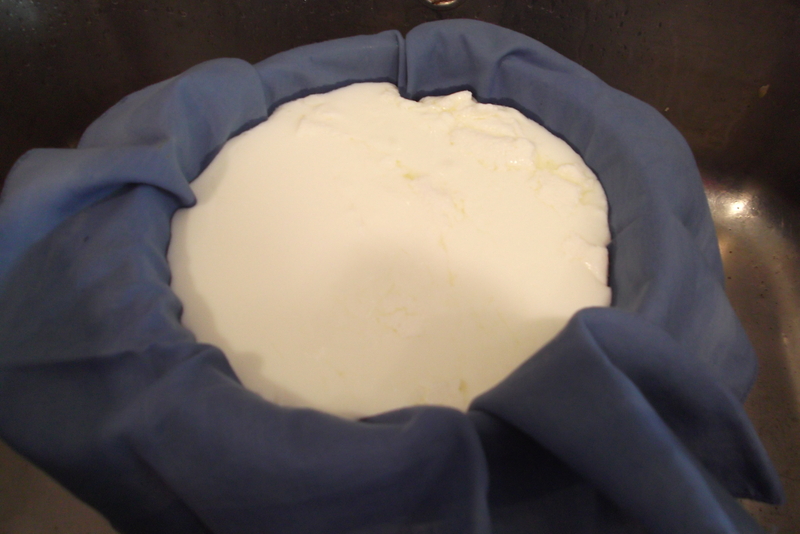 To make it into Greek style yogurt you will need to strain it. Set your sieve over a deep bowl or pot, line with clean muslin (or whatever), pour the yogurt in and leave to strain in the fridge. 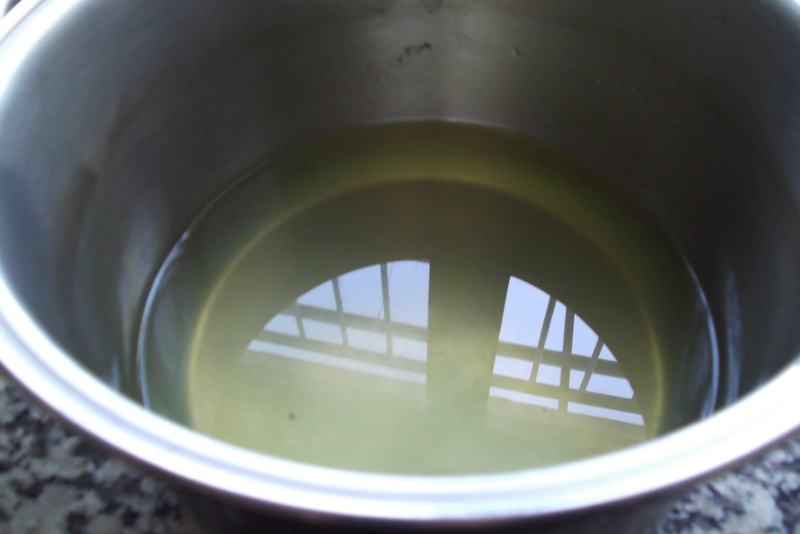 When the time is up, you are left with quite a large amount of liquid which can be used in cooking or given to your chickens! 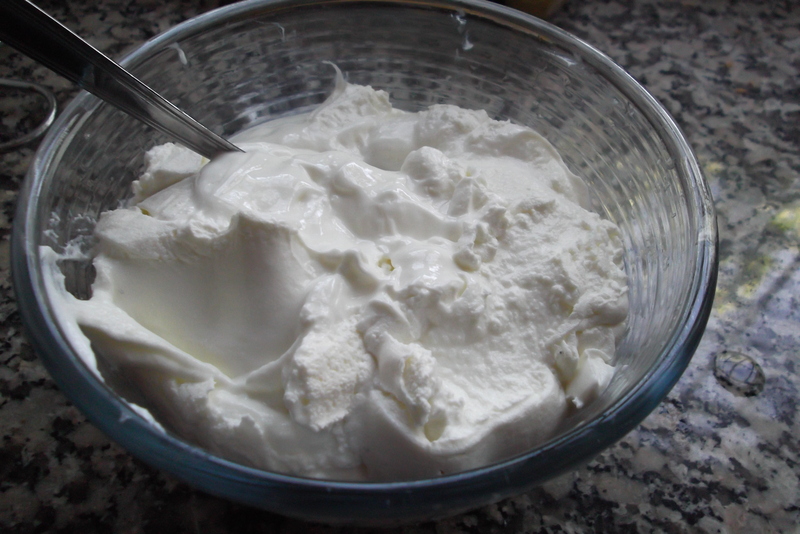 and a lovely bowl of super thick and creamy yogurt (give it a beat to loosen it all up, then keep chilled). 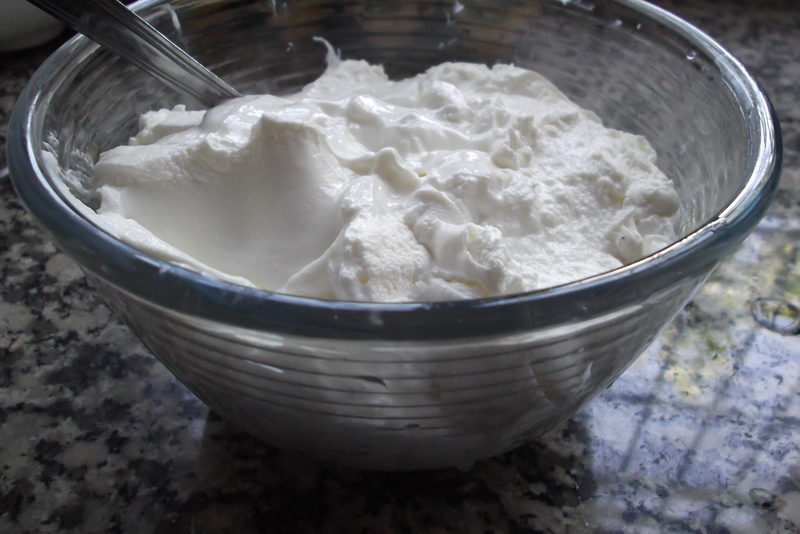 If you keep back two or three tablespoons, you´ve got your starter for the next batch. What you do with your delicious yogurt now is only limited by your imagination…. !